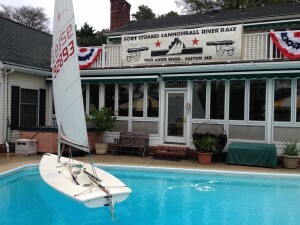 Several months ago the clever team of Harry Henkel and Roger Baldwin, from the Oxford RC Laser Fleet, got together over a couple of lemonades and came up with the idea of a river race on a portion of the Tred Avon River in Easton, MD. 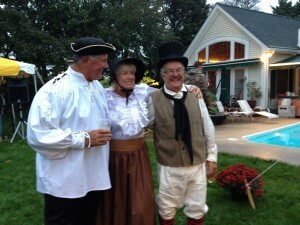 Roger and his wife, Rosemary, live at the headwaters of the Tred Avon River, adjacent to the historic Ft. Stoakes. Ft. Stoakes defended the town of Easton from the threat of attack from the British in 1812 and so the Baldwin compound became a perfect place to host this event. Thus was born the Ft. Stoakes Cannonball River Race held October 12, 2013. It was much much more than a race. We all have been to various types of outdoor parties with stripped tents, themed decor and appropriate flowers to create the ambiance of festivity. The Henkel/Baldwin team just went over the top to make this the most memorable RC Laser event in history. It will be hard to top this in the future. You will hear about the race later. but from the Pledge of Allegiance to the dance band, this raucous good time featured a custom song, “The Ballad of Ft. Stoakes”, written by Roger Vaughan, music by Bob Roe, as well as original art from John Tochko, who created a spectacular banner hung from the Baldwin upper deck, as well as a regatta logo laser printed on every crab mallet. 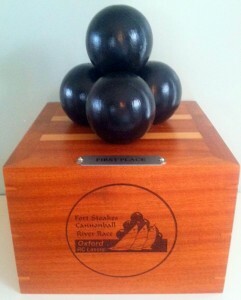 Harry Henkel , with help from John Tochko, created beautiful trophies with cannon balls affixed to wood bases. The mayor of Easton, MD, Bob Willey, came early to kick off the event and he joined the committee boat to view the entire race and then went home to get his wife, Betsy, to join the party. There were appetizers, bushels of crabs, grilled chicken, pulled pork, bean salad, logo decorated cake and cookies, a before and after flag ceremony, canon fire to start/finish the race and call attention to colors. But wait, there’s more. 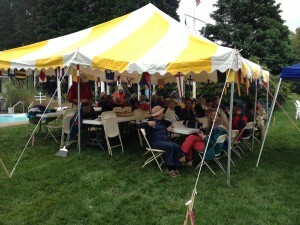 We had an open bar, coolers of beer and sodas, hugely decorated tents, nautical and international banners, a country/oldies rock band that got us dancing as well as plenty of stories of how we got up and down the river in the race. “Start your engines.” Launch and support craft line the Baldwin dock at the ready. The race, as well as most of the day, was held in a slight drizzle but everyone will probably tell you that we don’t remember that it was a wet day. The essence of a long distance race is that each RC skipper has a much needed partner operating a launch craft of any type while deftly maneuvering the launch around and away from other competitors craft both large and small. Being polite to your launch partner was imperative if you wanted to have a successful race. 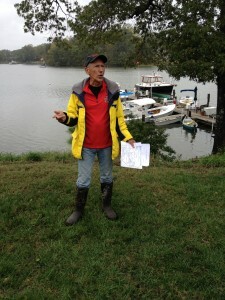 Don Barker, the race director, led the skippers meeting with instructions that included “hitting buoys was ok” (there was only one buoy to round) including hitting the start and finish bouy, as well as “if any sail changes were to be performed, the support launch was to be in neutral.”. A starting/finishing box was buoyed off in four corners and that area was reserved for RC Lasers only. Support launches were to be outside the box. A cannon blast sent us down the river and the initial strategy at the headwaters was to deploy “A” sails. We experienced a puffy but mild NE breeze that sent us on a run down the river to a government mark two miles away. Right from the start, the 11 boats began to separate as the West shore became favored. Those of us in the middle of the river, self included, dealt with a series of puffs followed by lulls. 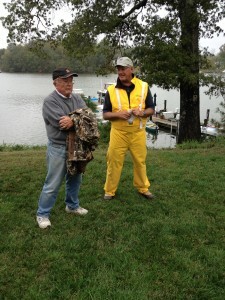 (Note: From here on I will refer to the RC Laser skipper first followed by the launch boat team mate). The lead was quickly snatched by West Jersey’s Victor Oberg/Dave Brawner who began to feel that this was like taking candy from a baby. Hah! Hah! Mother nature started playing with them about a third of the way down the run and she either made the fleet do unwanted gybes, nose dives, round ups and then find us a lull in the wind in between some freshening puffs. Thus began a rush to do NASCAR-like sail changes to the “B” sail while a few hung onto the “A” all the way to the mark. Oberg/Brawner began to panic as the fleet began to compress at the mark. With A’s still aloft, Jim Karr/John Trax and Don Barker/Clare Barker, actually got around the tuning mark in a virtual first place tie, rounding inside of a struggling Oberg/Brawner. West Jersey’s Jamey Betz/Luke Betz,, now in a B sail, rounded third and began a couple of crossing tacks with Barker/Barker but Barker/Barker began struggling to make A sail progress and switched to the B as did Karr/Trax. Along came Bob Roe/Dave Brooks and Dave Branning/Elaine Helpkin in B sails who swiftly rounded the mark and, to their surprise, grabbed a tight first and second place from the four boats who arrived or rounded ahead of them and were still struggling in the now freshening wind at this point in the course. This was now a tight race with 2 miles to go upwind and against the slight current. The wind was very puffy and, at times, the B sail seemed overpowering, but if you struggled through each puff the wind would quickly subside enough that the B stayed very effective. Branning/Hepkin held a very short lead for a short while but Roe/Brooks began to pull out to a 5-10 yard lead as the two Oxford Fleet skippers fought to keep their boats under control and avoid going into irons half way up the river. Behind these two, Jamey Betz/Luke Betz got into iron trouble and went to the C sail as did Oberg/Brawner. Don Barker/Clare Barker had to repair their flailing filament line and that put them way behind most of the fleet. With three quarters of a mile to go, Betz/Betz started making huge gains in the middle of the leg home with that C sail. Now it became a three boat race, but the calmer headwaters ahead were soon going to make that C sail ineffective. Betz and Betz went to the B sail ultimately to keep them from slipping further away from the leaders, but it was too late to close the whole gap. Dave Branning/Elaine Hepkin focused on getting Roe/Brooks into a tacking duel and it started to work especially when Roe/Brooks covered loosely on a couple of tacks and Branning/Hepkin slipped under them and, with a good header and pressure off the west shore, were able to cross Roe/Brooks about 200 yards from the finish to grab the win and the cannon. Bob Roe/Dave Brooks hit a couple of lulls in the last 200 yards while Jamey Betz/Luke Betz, staying in the pressure, came back to grab second with Jim Karr/John Trax in third, nosing out Bob Roe/Dave Brooks. Roger Vaughan/Tom Baker hung in there for fifth and a fast closing Don Barker/Clare Barker came from hundreds of yard back, after the filament line fix, to grab sixth place. Part of the crowd relaxing post race. Awaiting the crabs. 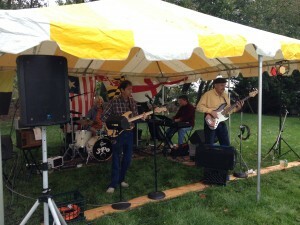 3 Penny Opera perform for the Ft Stoakes Cannonball River Race crowd at the Baldwin compound. 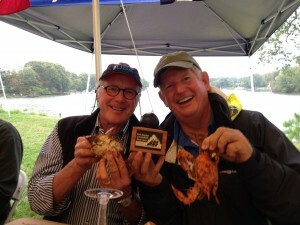 Driver, Dave Brooks and Skipper, Bob Roe, display their hard earned Ft. Stoakes Cannonball River Race fourth place trophy and crabs. Bob never met a party he didn’t like. All Good. A round of standing applause certainly goes to Roger and Rosemary Baldwin and Harry and Jeannie Henkel for their outstanding planning and execution of a fantastic RC Laser long distance race and party. Party is an understatement. Someone should have gotten married at this celebration. As Bob Roe likes to say. 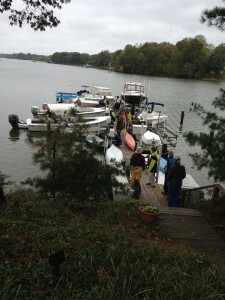 “It’s all good.” Thanks as well to our launch boat operators who made the race and the event so much more fun to share.